Michelle Monaghan has played more than her share of love interests and worried wives in plenty of movies that seemed otherwise unsure of what to do with her. But she maintains a more interesting sideline playing tough women in stereotypically male professions like private detective (Gone Baby Gone), miner (North Country), truck driver (Trucker), and now army medic in Fort Bliss. The movie opens in Afghanistan, with Monaghan’s Maggie Swann taking charge of a particularly gruesome battlefield emergency, the actress tackling the scene with no-fuss authority. Following this bit of heroism, Maggie returns home, ready to work at the Fort Bliss base in Texas as a staff sergeant and reconnect with her young son, Paul (Oakes Fegley). Writer-director Claudia Myers quickly establishes familiar haunted-soldier challenges: remembering traumas, sleeping on the floor, dealing with the looming threat of redeployment. More specific is Maggie’s relationship (and murkily established custody situation) with Paul, who has been staying with her ex-husband Richard (Ron Livingston) and his new partner Alma (Emmanuelle Chriqui), and must be dragged kicking and screaming back to his mother. Dealing with the reluctant kid, Maggie snaps into the same steely crisis mode she uses for life-and-death combat decisions, signified by the soundtrack going mute, repeating an effect from the early Afghanistan scene. Neither Maggie nor the movie apologizes for her dedication to her job, and Myers doesn’t shy away from showing her testiness as a parent, even raising questions about whether she should have custody of Paul. This lends Maggie a complexity that the other characters in the movie often lack. As a result, the non-Monaghan parts of Fort Bliss tend to go watery. At first, it’s hard to nail down a simple fact like Paul’s age—his lack of remembered attachment to his mom makes him seem young, but he speaks like he could be 7 or 8. Though the movie eventually gives this information (he’s 5), it’s not initially clear because Paul is more of a prop than a human being. Like a lot of characters in the movie, he undergoes changes independent of much that actually happens on-screen. Livingston’s role is particularly muddled, written as annoyed by whatever decision Maggie makes, whether it involves him seeing Paul more or less often. Not everything in the movie exists solely to jerk the story around in circles: Maggie’s romance with a local mechanic (Manolo Cardona) and her working relationship with another on-base officer (Gbenga Akinnagbe) have moments that feel more spontaneous. But the movie doesn’t select these moments carefully enough. This is especially clear when it treats a flashback-set subplot as crucial, even though it’s more like a sidebar that touches upon important issues—like wartime traumas and treatment of women in the military—that don’t necessarily meld with the specificity of Maggie’s story. Through the movie’s various strands, Monaghan does her best to tell that story with her performance, assaying a woman confident in her authority yet sometimes at a loss when confronting problems that can’t be solved with unyielding determination. It’s work that deserves a stronger showcase. 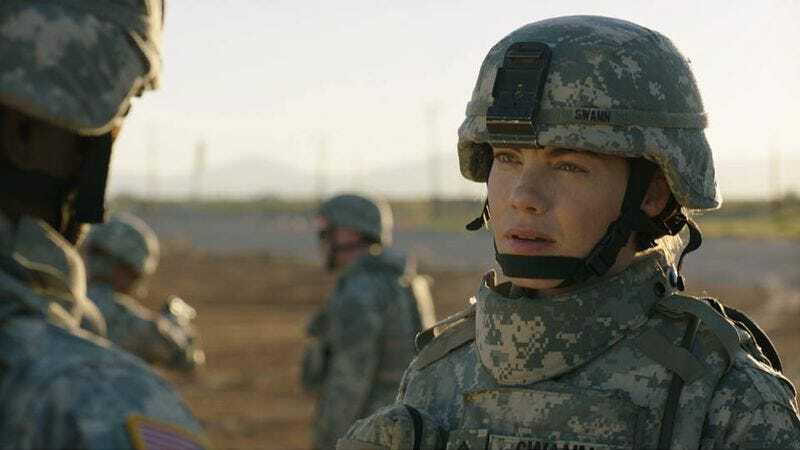 A movie like Fort Bliss seems designed to keep her in fighting shape, in case bigger productions realize that she can do more than kiss a famous co-star.